The W-Arly-Pendjari Complex is recognized for its biodiversity of birds, fish and plants. The park is located at a transition zone between savannah and woodlands, around a meander in the River Niger shaped like a "W". Its 1,714,831 ha is largely uninhabited by humans. It includes contiguous parks in Niger, Burkina Faso and Benin. From Niamey, it was a few hour drive through pastoral countryside to Parc National du W. Unlike parks in East and Southern Africa, wildlife was widely scattered and difficult to see through the thick bush, but I found several antelopes (roan, oribi and western hartebeest were new for me), elephants, African buffalo and crocodiles. I stayed at Hôtel de la Tapoa, just outside the park entrance (it had a pool, cold water and good food, so more than I expected). 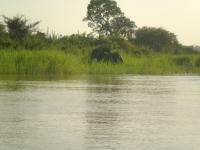 We visited Pendjari NP back in Jan 2007 during a tour of Benin, Togo and B Faso. It was interesting to experience a West African “wildlife park” but our conclusions were very similar to those of the previous reviewer! The real interest in W Africa lies in its cultures and peoples and, apart from the bird life, one would not particularly recommend it as a wildlife destination in comparison with many others across Africa. Mind you - we didn’t give it a great deal of time. We drove up in the morning from Boukambe at the edge of the Koutammakou area and arrived at the much hyped Tanougou Falls for lunch. My experience across many years is that dry countries tend to make too much of such “watery” locations which, elsewhere, would pass without much notice. I have seen the falls described as “a beautiful multi-tiered cascade that flows from the Atacora Mountains. They are the highest and most beautiful falls in Benin, attracting more tourists every year as they become better known.” A bit OTT – but they make a pleasant stop. Whether these lie just outside or just inside the park is not clear but there was a stone stating - “Pendjari - Man and Biosphere Reserve 16 Jun 1986”. We then passed the official park entrance and made an afternoon game run taking in grassland, river, marsh and light/heavy forest. There was a lake with a few hippos in it (but very unexciting compared with for instance Kazinga Channel in Uganda) and we saw some distant buffalo – which we presumed had to be of the Sudanese sub species (Syncerus caffer brachyceros) and are therefore different from any you might have previously seen in South or East Africa. Indeed if you are a great “chaser” after subspecies (or even “races”) of African animals then you will see some specialities in Pendjari – particularly of Bovidae! Another is the Roan antelope subspecies “Koba” - (Hippotragus Equinus Koba) whose current range only extends from Senegal to Benin. 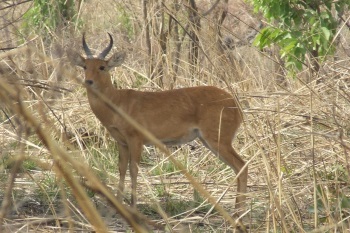 See very distant photo - this is the sort of view you are likely to get of many of the animals you will see in Pendjari - noting the “diagnostic” ears! A third is a subspecies of Bohor Reedbuck (Redunca Redunca Redunca) which I believe to be the subject of the photo I have provided above to introduce this NP! (“R. r. redunca lacks dark stripes on its forelegs. The males have thicker necks. 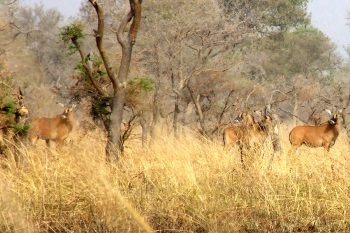 Its large, oval-shaped ears distinguish it from other antelopes” - Wiki!). The Bohor reedbuck can be seen in Central Africa from Senegal to Ethiopia but the subspecies Redunca is limited to Senegal - Togo. If such niceties are not of great interest then you could always hope to see Lion or Cheetah - but our impression was that you would have to be very lucky to do so! We did see some very distant Elephant but, when you have seen such creatures in Kenya or Botswana etc, it is difficult to work up much enthusiasm for such views. We spent the night in the “Hotel Pendjari”. It is nicely situated within the park – a little bit of luxury for us as, otherwise, we largely “wild camped” on this trip! Not bad rooms and even air con when the generators were operating, but this is not East Africa and the place was clearly suffering from underinvestment - our group were the only guests. We had another game run the next morning before leaving for Burkina Faso. But my diary and memory indicates that nothing more of note was seen. West Africa is not the right place to see animals. In most of the West African parks you can see practically nothing but the landscape. This was the case in Mole National Park of Ghana, where the most interesting animals we have seen were ants - forming a long strip on a lakeshore. Park W is much more difficult to reach than Mole, but as a reward, you can see some wildlife. Not comparable with the great East African parks, but at least there you can say, you were not sitting in a 4wd for days in vane. Because getting to the park is definitely not easy. First somehow you have to get to Niger -that can be a challenge itself. We tried to apply for a visa in Berlin, but were refused, so applied again in Accra where some "extra processing fee" helped us to get the visa of our dreams. Niamey is not a major transport hub, so finding a flight there is either difficult or very pricey. And that is also the case with onland transport, you either charter a 4wd, where prices reach the stars in the sky, or try to find a place in a bush taxi, what is exhaustingly slow, hot, and incomfortable. We chatered a 4wd for our round trip in West Africa, but the company refused to cross the Niger border with us. So our driver helped us in Malanville, the Benin side of the border to charter a bush taxi for the Niger part of our trip. As the car was in a surprisingly good shape, and the driver spoke some broken French, the price the owner asked was ridiculously high, and after an hour of serious bargaining we still had to pay much more than we wanted to. From Malaville to Dosso the road is horrible, we crossed a Martian landscape and the red dust covered all our clothes, our skin and the lenses of our camereas. From Dosso to Niaamey the road is at least sealed and the lanscape somewhat friendlier. We were crossing villages stuck in the middle ages, with their thatched roof mudbick houses, in front of what people were sitting looking at the cars, the only features of the 21st centruy they know passing by. After Niamey another 2 hours and we reached the park. The road is relatively good, and the park itself seems to be well kept up. As it is funded by the EU, some goals are followed that sound quite alien for other parks. All personnel is recruited from the local communities, so poaching is practically non existent. The guides - trained by EU programs - seem to be much more knowledgable than in other parks of the region. The prices are reasonable 5000 CFA for the entry and another 5000 for the compulsory guide. There is a hotel run by the villagers and a tent camp on the riverside. And the animals? Antilopes and hippoes are present and also some buffaloes and some elephants. Not in the innumerable quantities of the East african parks, but at least in visible herds. An evening and a morning game drive give you enough opportunity for pictures to fill your memory cards. But frankly saying it will not be the greatest wildlife experience of your life. But it is definitley the only theing the region can offer. If you want to make your Niger trip really unforgettable, visit the Kouré giraffes. That is an amazing experience. 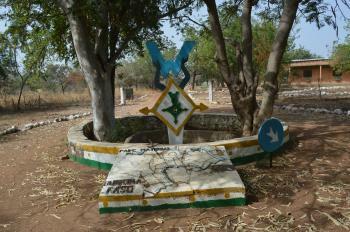 60 km-s from Niamey - on the way to Dosso - there is the village of Kouré, where the last giraffes of West Africa live. At the road sign you have to buy the ticket, and hire a local guide, who knows exactly where the animals are. We reached the group (11 of the 300) after 15 km on the main road and then a 3-4 km off road driving. And what we saw was totally stunning. Among sorghum plantations, goat herds and hamlets a group of tame giraffes were just chewing leafs unbothered by the presence of other animals, local people or even us. We were allowed just to wander around them getting as close to the animals as 5 meters. As wildlife experience it is much more rewarding than the park. Currently it is on the T-List az "Zone giraffe", and I hope oncxe it will get it to the list. It really deserves a place. Siraneans: West African manatee "others (species) have made a come-back (..... manatees)" AB. Controversial at inscription: IUCN was against inclusion, also controversy about advocacy by the representative from Niger on a site in his own country. Of the 19 members, 4 finally voted against (Australia, Canada, Germany and the United States of America), not enough to prevent a 2/3 majority. 12 Community Members have visited.